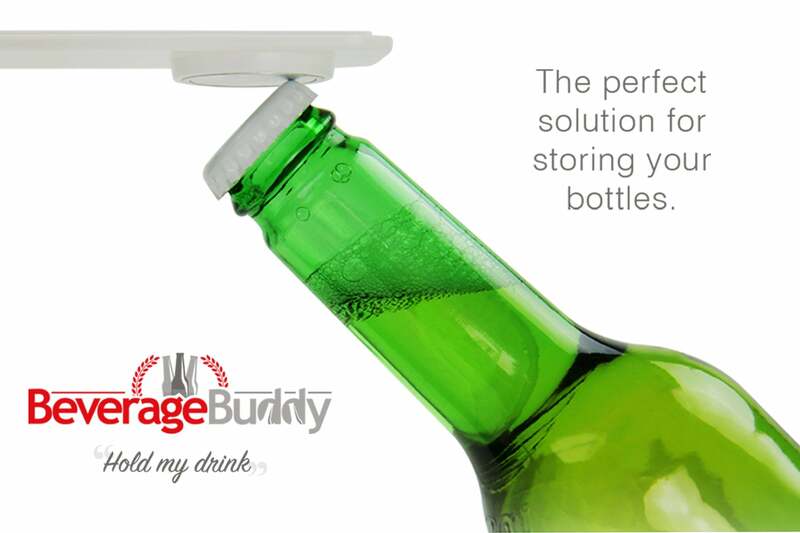 Magnet Expert Ltd are delighted to announce the arrival of your newest drinking partner, the Beverage Buddy. 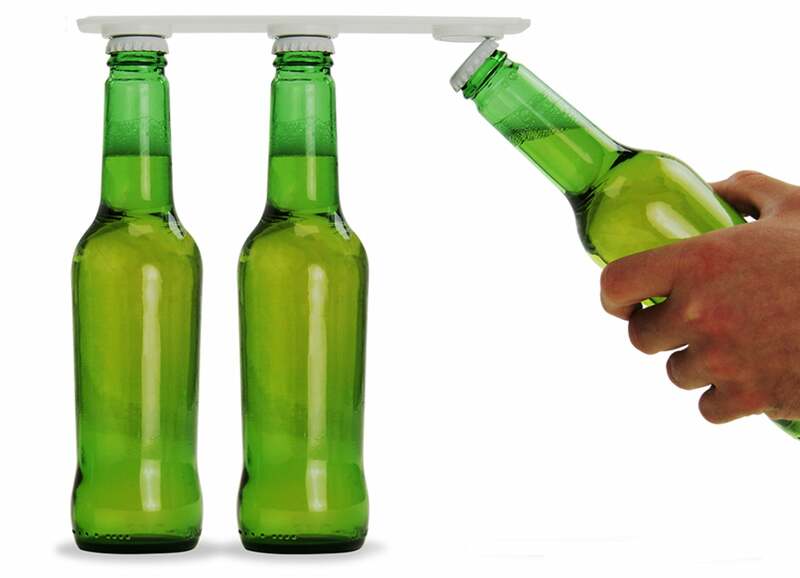 Store 6 of your favourite beers, lagers or soft drinks in the coolest way possible with each strip featuring three super-strong Neodymium magnets. 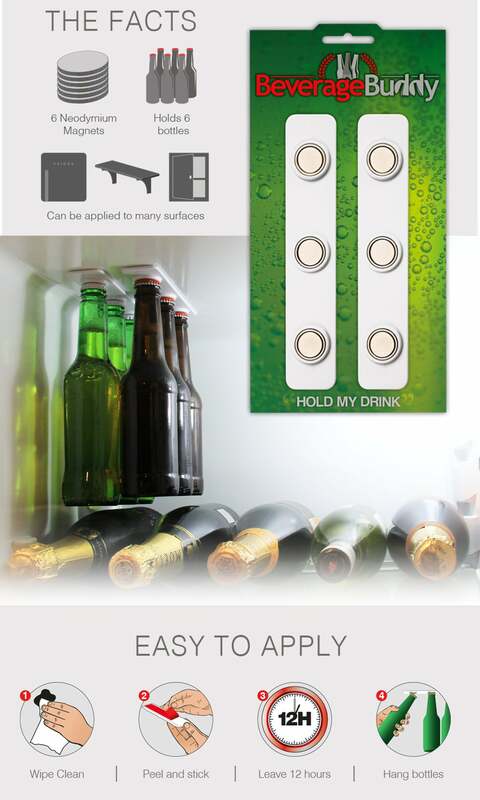 Apply your new bottle holder to the top of your fridge, shelf or cupboard with the impressive self-adhesive strips. Once in place, your Beverage Buddy will store your bottles proudly, freeing up space below for the everyday essentials. When you’re ready, grab a cold one by sliding the bottle away from the magnet, crack it open and enjoy. Replace this bottle by popping another onto the Beverage Buddy and it will chill until you’re ready. Friends, family and neighbours will be amazed by your innovation as we change the way you store beers, lagers, soft drinks and more. Step 1) Start by wiping clean your surface and ensuring it is clear of dust and other marks. Step 2) Once it's dry, peel away the protective sticker from each strip and reveal the self-adhesive. Apply the adhesive side to your surface, whether this is the roof of a fridge or underside of a shelf. Step 3) Wait at least 12 hours for the adhesive to fully cure. Step 4) At this point, your new drinking partner will be ready to store your bottles, jars and containers!